I was taken by this phrase while listening to the Knitting Pipeline podcast. Paula is a wise person and instead of saying she hated the noise and inconvenience, she said she'd be happy when the house next door was finished building. I'm not even sure she knew how powerful her framing was. This has been a slow season. We have had uncharacteristic snow and then an ice storm. I'm using this time for my own healing and renewal. Today I felt strong in yoga, I have been choosing good food choices for my body, and I'm reading more and writing more. The knitting is going slowly, partly because I can only work for short periods. Nurse, heal thyself. I am enjoying a knit-a-long with Imagined Landscapes Podcast, the #wearableblanketkal. I really rely on the encouragement of these fun knitters while I make acres of grey-blue. The only other thing I'm really working on is the crochet rabbit hole granny stripe blanket, for the pure pleasure of colour and soft texture. But I can see the longer hours of daylight. I am enjoying the extra reading and trying to make sense of the crazy political world we are sliding into. I'll be happy when my yoga shawl is finished. I'll be happy when I've finished the edit on my first short story assignment. I'll be happy when it's spring. But I won't wait until then to be happy with my life. I'm starting to get back some energy after the dark and icy days of the mid-winter. As I can't do most of my yoga practice, I'm out walking which means I can take photos of the new growth, feel the sun on my face (through layers of knits) and listen to podcasts. These are things that feed me. There has been some writing, both in the journal and for my writers' circle assignment. And it feels like a new season of acting and being like my real self. It is challenging to cook and serve all the colourful vegetables at this time of year. It's challenging to not spend all my days crafting and building and writing. I am enjoying working through some test knits for some special friends whom I have never met. The internet of knitters is a powerful place. I am finishing a quilt top for a wedding gift and that feels like a big thing. But there are friends and family to meet with and celebrate. January is a month of birthdays in our world. And I do believe in celebrating the important people in our lives. Robert Burns Day was this week. We didn't eat haggis, having already partaken at a feisty Burns Dinner on the weekend, but we did go to Pipe Band practice and share stories and music with our compatriots. Chinese New Years is tomorrow. Shall I rummage through the freezer and come up with some egg rolls and dumplings? Why not celebrate? Friday has traditionally been treat day in our house. Today I am treating myself to getting some chores ticked off the list and spending time in my sunny little room, writing and planning. I am redefining what "treat" means as I can no longer enjoy ice cream or very many baked goods, and tire of too much shopping. And being true to a practice, of writing, or blogging, or home keeping, is a treat in itself. My days are my own to look back on and measure if I have accomplished something valuable. Today I will tap into the warmth and inspiration while the sun shines. It's a new year and I finally feel like I'm starting it. The raucous re-blooming of my Christmas cactus lightens my heart and these short, dark days. With encouragement from a friend on Instagram who is a brilliant photographer, Owl and Lily Photography, I have picked up my sweet Nikon camera and am thumbing my nose to the iphone and apple updates that stymie me. Try another way. And that is trickling down from all my new plans. Don't give up on a bulb that is not ready. This pink amaryllis just needed more time and nurturing. Kind of like me. I am retired from Sunday School teaching and the countless meetings that were taking all my energy. I am disappointed that the community did not grow and share the vision. But I am not so old that I can't learn a new trick. With taking a break from church in January, I am nurturing myself and discovering new (and old) outlets for my dreams and schemes. Dude, I joined a writers' group!!! And it's in the library!! The last time I was invited to one, I was just starting the Chilliwack Common Threads Knitting Circle and I felt it needed more work to become a welcoming time for sharing friendship through craft and for giving back to our community. The group continues. I am happy now that I stepped down and they found a new venue, but it was a bit tough at the time with others wrestling for control. My better self let them take it. But I still have so many friends and contacts from that time. And now it is time for something I really want to do. I have been writing stories since I was 4 years old and it is a big part of my self image. Except I haven't been taking time for it. With this gentle and generous group, I will have some external incentive and can talk about the beauty and importance of words with like minded individuals. I will be taking this blog in a new (old) direction as well. I have been hoping to make it more than a travelogue of my week. 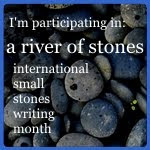 I plan to muse over ideas here, to connect better with my on line community, and to share some relevant words. There will still be knitting and other crafting, but those are still a means to connect with myself and others and to create. While I have been unable to access the pictures on my phone, related to different download issues, I have been making and playing. As well as a "to knit" list, I have a queue of other crafts. I finally sat down to the sewing machine and made the lavender sachets I had embroidered. I still have lots of lavender left, not including this year's harvest. I'll have to plan for some more. A spontaneous crochet, I wanted to use some of my cotton stash and make dishcloths for my sister. Well, I had to learn how to do Tunisian crochet all over again! Just sat with the hook and the yarn and stared at it. Thank goodness I had a good teacher, Sarah Bee and found some on line resources at Purl Soho. Christmas crafting continues. I love this Wurm hat. It is for a nephew who actually wears hats I make him and used almost exactly one skein of wool blend yarn. The pattern is so easy to memorize, I 'm sure I'll make more. D bought some cranberries from a local farm. It ended up being about 15 litres! They were dry picked and so lovely. I washed them and bagged them up for the freezer. Seriously sharing these! He says you can put them in drinks. But he drinks scotch and beer? Should I try? We paraded in the Rosedale Days parade, just east of Chilliwack, and there were so many tractors and so many families with kids, including my niece and great nephew. Almost the last knit. It is appropriate to give mitts to ones manicurist, no? These were knit in only one day a piece! I also knit a cowl for my hair dresser, but it still didn't want to load. My friend, Sarah Bee, knit a Sasquatch mask and invited me over for a photo shoot. We went to the far side of Cultus lake and had so much fun playing on the trail and taking shots. Then we went to an awesome gluten free bakery and bistro in Abbotsford, about 30 minutes west on the #1 Highway. She loved choosing from the entire menu. There were little yarn ghosties too!! We knew we were among friends. On the way back we stopped in Yarrow at a pumpkin farm. Like little kids! We had 9 trick or treaters. That's a 19 year record! Our driveway is long and dark. To celebrate Hallowe'en I knit some teeny zombies. But now it's November, so move over spookies and make room for gnomes. I always plant an amaryllis (and one to share) on November 1st, All Saints Day, and try to remember friends who have passed in the last year. The morning fog is starting, but it is still nice in the afternoon. I have to do some garden tidying. We started practicing for Christmas music at church and in the community. And I finally wore the hat Emily gave me for Mothers' Day. She is making them to order and selling them to her friends. I embroidered a ribbon. It makes me so happy to be surrounded by the kindnesses of my children. I have been putting up the little drawings from their early days and the setting out the pottery and gifts they made at school. It has also been a difficult few weeks because I do a lot of volunteering and really put my heart out there. But I feel that I am underappreciated and given more and more work in isolation. After a few sleepless nights and lots of journalling, I decided to step back and then take a break in January. My focus this year has been on wellness and I have done so well with yoga and strengthening. I don't want to risk that with becoming crazy busy and increasingly stressed. That's one reason why the Christmas knitting is done early. I like to spend the holiday season visiting with friends and baking cookies. As old as I am, it's time to lean into my own strengths and not try to make everyone else happy. Conquering real difficulties. Rather, spend time with people who like to be happy too. I love the gentle thoughtfulness of the heroine in these books. It is a good example of how to handle the technological glitches that I stumble over. Hint. Try the same thing again. No logic, but it works. These shears celebrate the 100th anniversary of Singer in 1951. They were brought to our Prayer Shawl Circle by one of the knitters. What a treasure. My Peace rose is about 15 years old, but this is the year it decided to major in blooming. I am back to swimming once a week and am so grateful that I have the space and time to swim laps and zen out. Our old apple tree has given us the most wonderful apples this year. They often fall before they are ripe, or are stolen by the squirrels. The last of my Christmas knitting is sorted. There may be surprises and disappointments, followed by new plans, but I feel the pressure off. I like to spend the season enjoying the company of others, singing and eating cookies. For less stress, there will be fewer knitted gifts this year. But I am happy with what I am scheming. These old boots were found in the thrift store. I have spent too much time this year looking for boots that fit. They are all too expensive and don't fit my high arches and long feet. These boots fit as if they were made for me! I love the heavy soles and the leather that knows how to take polish. Just right for this old thing. We were invited to New York to visit friends we used to go to school with. What a great opportunity to catch up and go for an adventure. He is our daughter's Godfather, so we really think he's great. His new partner is lovely and, even though they are high powered CEOs in international companies, he grew up a neighbour and appreciates that we are more than just country mice. We stayed right in Washington Square. Greenwich Village is charming, right in the midst of NYU, lots of restaurants and live music. At night there was even music under the Washington Arch. One of my favourite stops was the New York Public Library. I was there a few years ago (the Rose Reading Room is still closed), but I was drawn to it. In the children's area they have the lovely lion in Lego! And the actual Winnie the Pooh and friends. This is so exciting because these were some of the first books I read, even before I went to school. My big sisters loved Pooh, too, so I had lots of chances to read and listen to the stories and poems. We walked everywhere! There was subway travel too, but lots of walking in over 38 degree and humid weather. The Flatiron building is so cool. We were home and safe before the bomb went off. Walked across the Brooklyn Bridge with many others. It was pretty exciting. The view of Manhattan is stunning. It was September 11, so we went to the memorial at Ground Zero. The official programs were over, but there were still lots of people. The new tower is stunning. We rode to the top of it later and saw all around. We enjoyed stopping at Central Park. One day we went to the west side and the Museum of Natural History. Just as advertised in my son's favourite cartoon. The Statten Island Ferry was very cool. Just 25 minutes one way. We got right on and took pictures. Then we got back on a return ferry. On the east side of Central Park is the Metropolitan Museum of Art. D Liked the mummies. I liked one of the first things I saw, a Roman lion. We had dinner out and especially enjoyed this Italian restaurant by Mario Batali. We were treated like locals and encouraged to relax. Some of our souvenirs. We didn't do much shopping. It was great to see live jazz and explore such a dynamic city. There was very little knitting. We look forward to returning in a few years to visit our friends again.